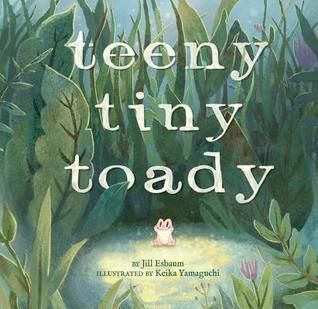 If you have ever felt teeny tiny, like someone else is stronger, bigger, and more capable than you, then you will relate to the little toady protagonist in the picture book Teeny Tiny Toady, written by Jill Esbaum and illustrated by Keika Yamaguchi. Our hero, whom we only know as Teeny Tiny (there are no names in this book) doesn’t think she is up to the challenge when danger befalls her mother at the pond and she is the only one around. Instead of having confidence in her own abilities, she runs home to rouse her seven brothers from their chip-eating, bubble-bathing, weight-lifting and arm-wrestling daily activities. They rush to the rescue, but fail to acknowledge that Teeny Tiny is the brains of the operation. They end up in the same predicament as their mother and Teeny Tiny is forced to rally her confidence in order to resolve her problem. I love books that rhyme and do it well. I wasn’t sure about this book the first time I read it. I needed a practice round to find the meter, but once I did, I found a fun and and action-packed romp through an earthy green and brown and yellow world. The brothers are confident in a brawny, “let’s do this” kind of way and the illustrations match their attitudes. 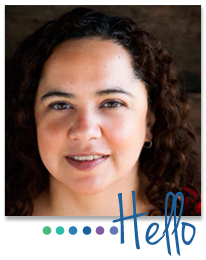 They are drawn as large and strong, while Teeny is small and has an anxious expression. When Teeny is left alone, the world is suddenly colored with blacks and grays as tumultuous as Teeny’s fears. A breeze brings with it an idea that colors Teeny’s world in blues and greens again. I have to admit that I looked at the solution from an adult perspective and was skeptical, but the kids weren’t, not at all. They loved the idea and they loved seeing Teeny finally become the hero she always was. For teachers and parents, this book has a valuable message about believing in yourself even when you are the underdog. It also has some onomatopoeia that will definitely enrich reading skills.